In the middle of winter, I have zero interest in smoothies. Don’t get me wrong, I love smoothies (and am definitely jealous of the California girls on Insta who drink them all year long). But when it’s this cold, a chilly beverage in the morning does not appeal to me. Mornings tend to be rushed, so I’m always looking for new breakfast ideas that are warming and nourishing, but also super quick to assemble. Enter: Sweet Potato Breakfast Bowl. Something that always helps me speed up my breakfast is using leftovers from dinner. When I woke up one morning last week with an extra baked sweet potato from the night before, I had an idea. I figured it would be the perfect opportunity to blend it up with some New Barn unsweetened almondmilk for a sweet and filling breakfast bowl. I blended it up with just a few simple ingredients and got a delicious creamy base that could be topped with anything! It’s sweet, savory, and the perfect winter breakfast. New Barn is on promotion throughout all of January so go check out your local Whole Foods to find it on sale and get 2018 started off right! (Pro tip: if you buy a case of anything at Whole Foods, you get an extra 10% off, in this case ON TOP of the sale price. Score!) Check out New Barn’s store locator here to find out where else it is sold near you. I was psyched to find out that my local health food store just started carrying it a few months ago! If you are not on Whole30, I love this sweet potato breakfast bowl with an added scoop of vanilla protein powder but honestly it’s quite filling without it! 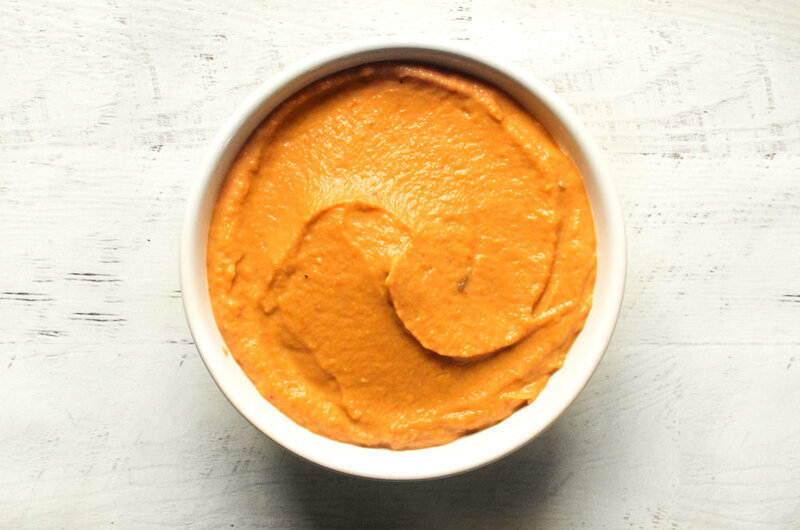 Cashew butter provides healthy fats, while the sweet potato, almondmilk, and even toppings like hemp hearts all have protein on their own. I also love adding fruit like goji berries, frozen blueberries, and always a handful of cacao nibs for some extra crunch, flavor, and antioxidant power. This breakfast bowl has it all. Notes on the baked sweet potato: if you have the time in the morning, you can bake the sweet potato up fresh. But seriously, who has an hour to wait for a sweet potato to bake in the morning? Leftovers to the rescue. I usually bake a few sweet potatoes at a time so I have them for the week. (Stab them with a fork all over so the moisture can escape and then wrap them loosely in tin foil. Bake at 400F for about an hour, give or take depending on your oven.) If you are using a leftover sweet potato from the fridge, you may want to heat it up slightly after pureeing. If you have a high speed blender, it will actually heat up slightly as it blends. As always, let me know if you try this recipe by tagging me @hashtagvegan and using #hashtagvegan so I can see your creations! A big thank you to New Barn for sponsoring this post! Recipe and opinions are 100% my own and I only work with companies whose products I genuinely use and love. For more info, check out my full disclosure here. Put all ingredients (except for your toppings) into a blender or food processor and blend until smooth. Use a rubber scraper to transfer the mixture into a bowl, and garnish with your favorite breakfast bowl toppings! Optional: for an extra filling breakfast bowl, add a serving of protein powder when blending.